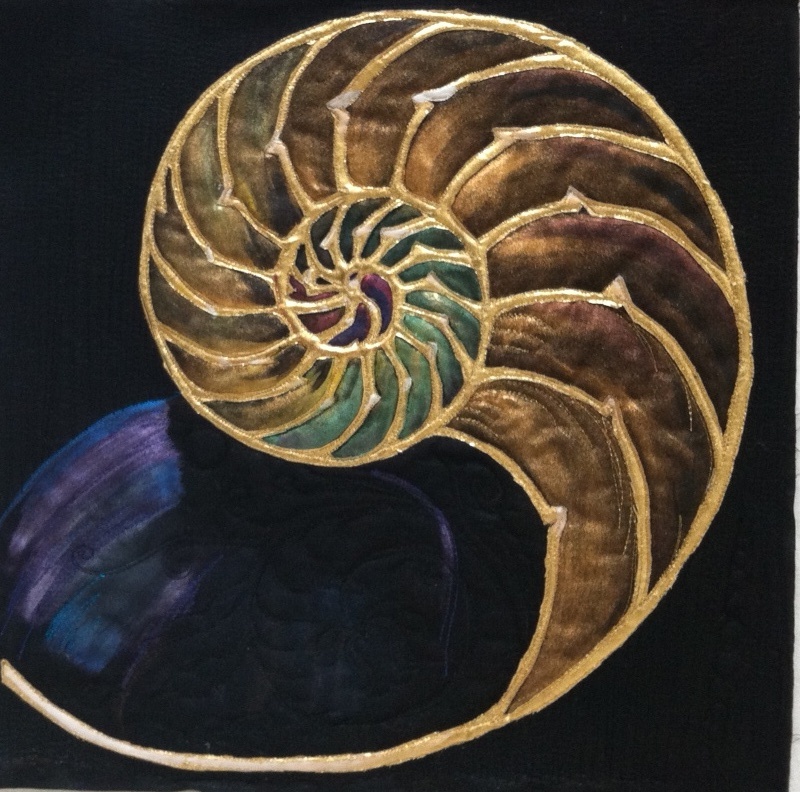 I had drawn 5-6 Drawings of the nautilus a creature that has amazed many with its mathematically perfect form .The drawings turned out to be too complicated for a little quilt, hence a simpler form of it . 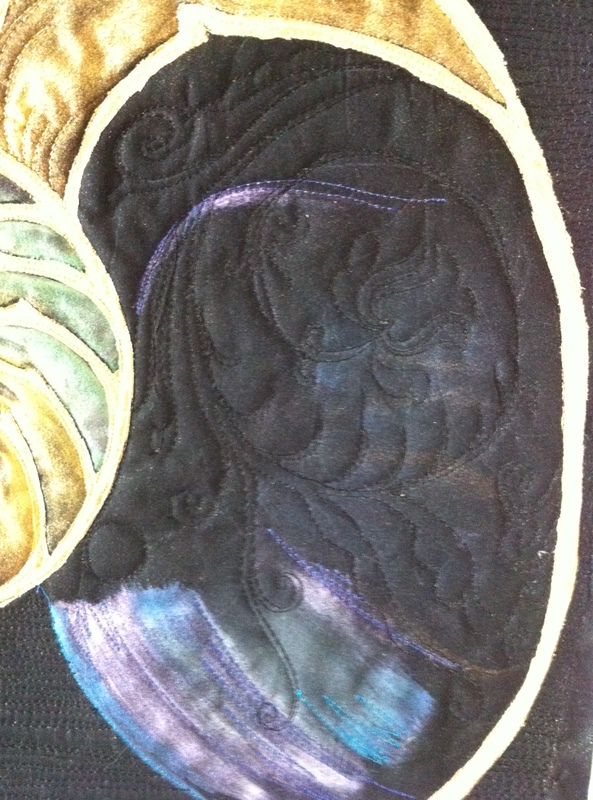 I have used gold lame for the outline and painted the insides with pearl Ex powdered pigments by Jacquard ,then quilted around the pattern ,I wanted a a fountain of leaves and tendrils cascading out of the shell but I was not successful with it, the hands just did not make it happen . 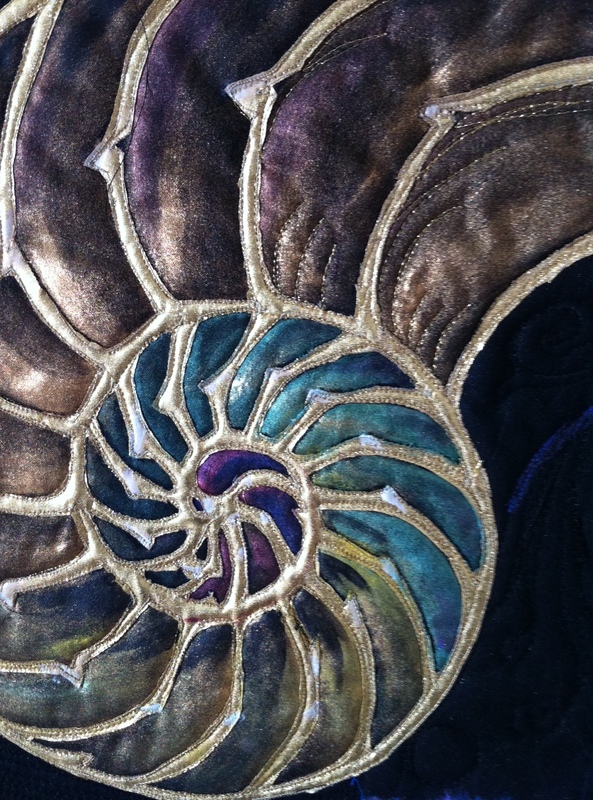 May I say that it is very obvious why I thought of Nautilus as Rhythm, everything about its form reminds me of musical instruments, it could well be a Jal terang if each section has a little water in it, how proportionately the sound would vary .The gold edgings remind of the symbols that are the major sound in the rhythmic crescendo in most of the pieces that my son plays. I love the way the Nautilus came out. The colorings are fantastic. Thank you all so much for such encouraging comments ,Paulette I do not know if I am calling or spelling the word right but the golden fabric is what i am calling Lame ,it is 100 percent Nylon and you get it in many colors normally I use it for burning with soldering Iron.